Enhance your store for a better browsing experience with Prestashop Home Tabs. After you install the extension, an extra block with tabs appears on the main page. Tabs display recommended products, items on sale, bestsellers and new products. Add products to the Recommended tab easily in the back-end. Other tabs content is generated automatically. Groups of your store’s most attractive products can now be displayed all in one place on your main page. After Home Tabs module is installed, a stylish block with tabs will draw users’ attention. 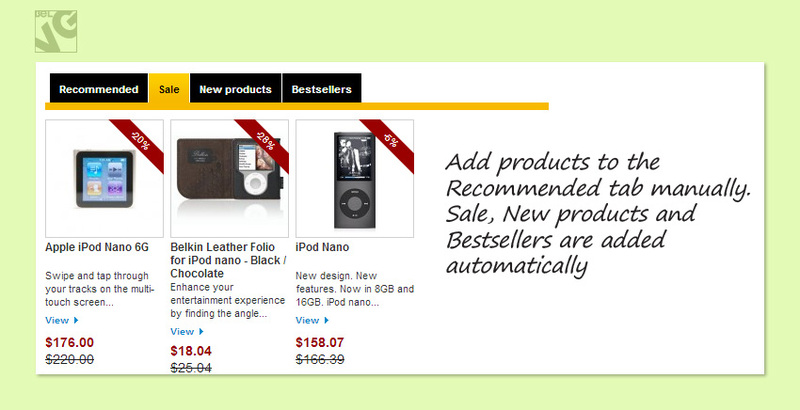 By clicking the tabs, the user will browse through products you recommend, discount items, bestsellers and new products. User-friendly tabs will help the user find the necessary item instantly. The customer will proceed to the respective product page and purchase the one. 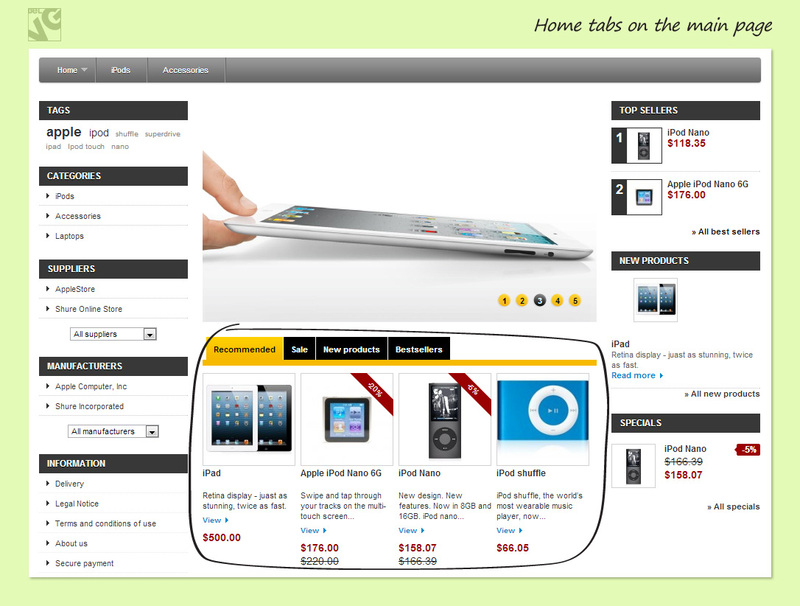 Prestashop Home Tabs is an easy way to boost your sale. Navigate to Modules –> Front Office Features –> Home Tabs -> Configure. In the first line, enter the maximum number of products being displayed in each tab. In the next lines select if, respectively, Sale, New products, Bestsellers and Recommended tabs should be displayed within the Home Tabs block on the main page. To select a product as a recommended one, proceed to Catalog -> Products. Click the Edit action in the respective line. 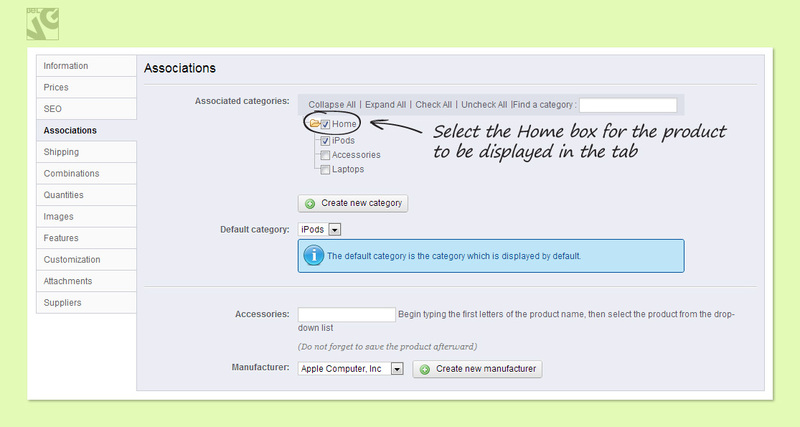 In the Associates tab, in the Associated categories area, select the Home box. The product is now associated with the Home category and will be displayed in the Recommended tab on the main page. The extension adds products to other tabs automatically. Home Tabs appear in the main page. Visit the demo page or read the user guide to see how the Home Tabs works.